This page shows some of the models that have been through the Rhos Helyg Locomotive Works recently. Latest additions appear at the top of the page. Please see the Gallery page for more finished models. You may click on the pictures to see enlarged views. This Accucraft NGG16 was purchased by the current owner in the particularly lurid blue/green colour scheme carried by full-size No. 138 for a short time. The owner dismantled the loco and the parts seen in the picture came here for attention. The various lumps were completely dismantled and the body components (water tank, coal bunker, cab and boiler wrapper) had their existing paint removed as required. They then received etch primer followed by black and maroon with much masking in between. Lining in yellow with black edging followed, as per full-size 138's current livery, with correct pattern and size number plates supplied by MDC. Finally, the myriad of parts were put back together in preparation for the owner to complete final assembly and a return to working order, as shown in the second picture (by Jon Carter). Roundhouse Engineering Mr. Merlin's Pooter 0-4-0T "PENTREFELIN"
Could this be the rarest Roundhouse Engineering loco type...? It was back in 1986 that this model first appeared, but only a very limited number were made. It is a Mr. Merlin's Pooter. I can find very little about these on the internet, with the prime source being Roundhouse's own "History & Museum" page and which includes the only picture I could find of one. From the Roundhouse History & Museum page: "Tom Cooper, formerly of Merlin locomotives commissioned Roundhouse to produce locomotives for him when he parted company with Merlin. Tom advertised this under his "Steamlines Models and Publications" banner as Mr. Merlin's Pooter though it was known as Thomas's Tank Engine at the factory. Not many were produced before Tom moved onto fresh pastures and the model was withdrawn early 1987.". After a few modifications, including to the boiler steam turrets, it reappeared a year or so later as a very European-looking model called Erica. The model uses the standard Charles Pooter chassis with a new body and a one-piece cast smoke box. The meths-fired boiler, in common with other Roundhouse locos of this time, is made of brass. It is fitted with radio control on both regulator and reverser. A nice touch is the engraving on the bracket that holds the radio equipment in place. This one came here in a sorry state and mechanically completely worn out. Both cylinders received full overhauls, all rods were replaced and new wheels, cranks, axles and bearings were fitted. It was then a case of going through the whole thing and correcting the many issues that it had. 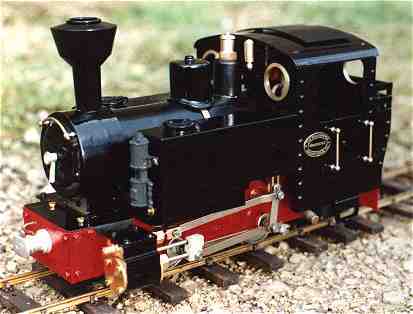 Maxwell Hemmens Ogwen 0-4-0T No. 32 "ARTEMIS"
Roundhouse Engineering Elsa 0-6-0ST No. 19 "ACANTHA"
In 1990 Roundhouse produced the Elsa 0-6-0ST as a limited edition for one of their UK dealers. It was based on the existing Jack design but used the 6-wheel chassis from their William model and was supplied with a bogie tender. ACANTHA started life as an Elsa, but the current owner wanted to use it without the tender. This involved installation of the radio control receiver and batteries on to the loco. At the same time it received some mechanical and body repairs, and a full strip, repaint and lining. ALTHEIA started life as a standard 0-4-0ST Jack, but the owner wished it to be an 0-6-0ST to match ACANTHA. The loco was completely dismantled and the Jack chassis was removed. 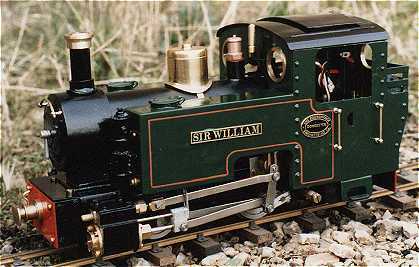 A new 0-6-0 chassis was built using a much-modified and shortened Lady Anne chassis kit and the original boiler, smokebox, gas tank and other components were mounted on the new chassis. It was also converted to radio control operation and stripped and repainted. Both locos had the large gap in their lower cab backs filled with a pair of dummy sliding doors. The upper cab back was fitted with a removable fabric backsheet, expertly made by my mother-in-law. This railcar is based on a Bramble Line kit. I assembled one of these a few years ago and sent it to its owner in bare brass condition for him to complete. However, the owner of this one wanted it powered and fully-finished as part of the job. I do basic electrical work but I avoid anything to do with electronics and so assistance was sought and found. The assembled and very bare brass body was sent to Friog Railway Services who fitted it with bogies, a power unit, radio control and sound. It then came back to me for fitting of windows, removable roof, door and grab handles, roof ventilators, headlights, horns, replacement buffer beams and couplings. Finishing work included lots and lots of painting, fitting of floor coverings and installation of seats. The final job was application of the ESLR transfers provided by Endon Valley Custom Decals. The photographs alongside show the final result of an unusual project and commission that some may not recognise. This collaborative project between Rhos Helyg Loco Works, model owner Adrian Moore, John Shawe of Shawe Steam services and inspired by the help of David Charlesworth of the Darjeeling Himalayan Railway Society has been many weeks in the workshop of Rhos Helyg Loco Works. In 1970 the Darjeeling Himalayan Railway sold four of their iconic ‘B’ Class 0-4-0ST steam locomotives to a coal mine at Tipong in Assam, about 630 miles from Darjeeling. The locos concerned were numbers 781, 784, 789 and 796. To say they had a hard life at Tipong is an under-statement. They were worked hard, abused and were extensively modified to cope with the local conditions, and all with the absolute minimum of maintenance. Modifications included a fatter chimney (the reasons for which we have so far failed to find), replacement safety valves on the dome of a type usually found on static industrial boilers, and some very prominent pipe work over the coal bunker for the boiler injectors and steam blower. Various videos of the full-size locos at work, along with Bagnall 0-4-0STs that also work there, can be found on YouTube by searching for “Tipong colliery”. I have always had a very short list of models that I would really like to make, and this one was in the top three on that list. I first saw pictures of the Tipong ‘B’s in the late Terry Martin’s superb book Halfway To Heaven, and I couldn’t quite believe what I was seeing! Could somebody really do that to a ‘B’ Class? Well yes, they could, and they did. One day while chatting to Adrian, who is a good friend and customer of mine, he mentioned that he was on the lookout for another loco and that he quite fancied the Roundhouse Engineering ‘B’ Class, but was reticent to get one as there are loads of them around and he wanted something a bit different. I tentatively suggested a Tipong version but he, understandably, had no knowledge of these engines until I sent him some pictures. His almost immediate and enthusiastic response was “Yes, let’s do it”. Based on the availability of high-quality photographs our choice was 789 as it appeared in the mid-2000s. Adrian and I then started a fascinating dialogue as to what would be possible, and we drew up an extensive list of requirements and guidelines of what would be possible and what would be compromises. At the top of the list would be that this unusual model would be based on a standard Roundhouse Engineering ‘B’ Class loco and no attempt would be made to alter the basic Roundhouse running gear. - Removal of headlamps, dome cover, buffer beams, dummy pipework, clack valves, front handrails, front steps, cab steps, hand brake handle and couplings. - Replacement buffer beams front and rear incorporating wooden dumb buffers and simple loop couplings. - Removal of the front sandbox, handrails, steps and apron to be replaced by a smaller apron, a different arrangement of handrails and steps and completely exposing the saddle tank balance pipe where it joins with the well tank between the frames. - Addition of valve chest and cylinder lubricators on the cylinders. - Removal of the smokebox door and replacement by the flat door used on the Tipong locos with crude hinges and fastenings and a patch repair plate at the bottom. The lighter colour around its rim is fire clay, used to keep the door air-tight. - Replacement of the standard chimney with the much fatter and tapered version used on all the Tipong locos. - Addition of a dummy steam blower pipe running between the coal bunker and saddle tank and then in to the smokebox. - Addition of patch repair plates to the lower edges of the saddle tank and the front and left side of the coal bunker. The tank was also attacked with a ball-peen hammer to give it some character. - Addition of a dummy sliding door on the lower right of the coal bunker, used on the full-size loco for clearing out the bunker. - Addition of dummy welds on the left side of the coal bunker to represent the replacement platework fitted to the full-size loco. - Addition of a dummy industrial safety valve on the dome. This fits over the standard Roundhouse safety valve and vents through the angled pipe. It was made by owner Adrian and is a triumph of design and machining. Making it vent properly was one of our design criteria, and Adrian succeeded with that considerable challenge! - Addition of dummy pipework, manifold, valves and clacks running over the top of the coal bunker. The manifold runs across the bunker just in front of the cab. Connected to it are three steam valves, accessed on the full-size locos through the front spectacle windows, with one on the left and two on the right. Two control the boiler water injectors (right and one on left) and the other on the left controls the steam blower. The clack valves either side of the boiler were also replaced with representations of those carried by the Tipong locos. Again, Adrian made the manifold, miniature valves, clacks and pipe flanges. - Replacement of the normal curved cab roof with a flat roof. - Rearrangement and selective removal of the handrails on the cab back, along with the addition of a cage just above the cab floor to retain coal on the footplate. On completion of the metal work the loco was painted in filthy black and grubby green, with basic red lining and a few yellow highlights. It may look worn-out, poorly maintained and generally knackered but as stated above no mechanical work was done on the original model at all so, unlike the full-size locos, it still "Runs like a Roundhouse". We always knew that some aspects of the conversion were going to be a compromise but both Adrian and I feel that the character of the full-size locos has been encapsulated in the model. Apart from the pleasure of creating this much-abused locomotive, we spent a lot of time discovering more and more about these locomotives and have discovered much information about some of the minute detail. This project would probably not have even started without the help of David Charlesworth of the Darjeeling Himalayan Railway Society and editor of their newsletter Darjeeling Mail. David very kindly sent us the pictures of the full-size locos seen here that showed various details that Adrian and I had been unable to see clearly in other photographs. Our sincere thanks go to Peter K Jordan (Fuzz) of Darjeeling Tours Ltd for the photographs themselves. Our sincere thanks also go to John Shawe of Shawe Steam Services for machining the dome cover, dome ring and new chimney, for supplying the steam valve and clack handwheels and for machining work on the smokebox door, and to MDC for supplying the custom-made 789 number plates. We must also thank David Churchill who has written the wonderful book The Incredible Darjeeling ‘B’ Class for various extra information, in particular further details about the strange safety valve arrangement on the loco. We do know a bit about these locomotives now…! And finally, my thanks go to Adrian not only for his machining work described above, but also for his faith in me that this project could be achieved. After all, once it was started there was no turning back! He accepted without question my suggestion in allowing me to produce this model. It has taken a considerable time to complete, mainly due to the “How are we going to do that?” emails and discussions, but I have thoroughly enjoyed working on it and both Adrian and I are absolutely delighted with the final result. We just hope Roundhouse forgive us...! Roundhouse Engineering Lady Anne 0-4-0T No. 3 "BRIAN"
An old meths-fired Roundhouse loco has been on the bench, this time a Lady Anne 0-4-0. This one had been converted to gas firing at some point but the current owner wanted it converting back to meths. The burner was in a sorry leaky state so some re-soldering was followed by a new set of wicks. It also needed attention to its safety valve that lifted at about 5psi and a few other minor repairs, including replacement of the boiler filling system using components provided by DJB Engineering. Subsequent testing under steam showed that all was not well, and the cause of the poor performance reported by the owner lay very firmly elsewhere. Basically, the poor thing was mechanically worn out. Such was the wear to the slip-eccentric valve gear that the slide valves barely opened and were preventing steam from entering the cylinders. It would run in one direction, but not the other. As the loco has sentimental value to the owner he decided that it should have a full and proper repair. New wheels, axles, bearings and, most-importantly, slip-eccentric valve gear were provided by Roundhouse Engineering and fitted. Both cylinders received overhauls, including replacement of all O-rings, gaskets and re-facing of the slide valves and their faces. All of this returned the loco to full working order. The owner and his grandson would be dealing with its bodywork and paintwork issues. Swift Sixteen Owain 0-4-0Ts No. 6 "LADY KATHLEEN"
and No. 16 "LORD RODNEY"
A pair of Swift Sixteen Owain bodies mounted on Accucraft chassis which were assembled, painted and lined here. They both needed some additional work to fit over the pre-existing radio control gear, and both gained the dummy whistle from their original Accucraft bodies. This Roundhouse Darjeeling 'B' Class came here for fitting of a cab back sheet, working lights and blackening of the rods and valve gear. The cab back sheet was beautifully made by my mother-in-law and can be fitted to any Roundhouse 'B' Class. All I need to have is the cab roof, with headlight and whistle removed for easier postage. Contact me for further details.